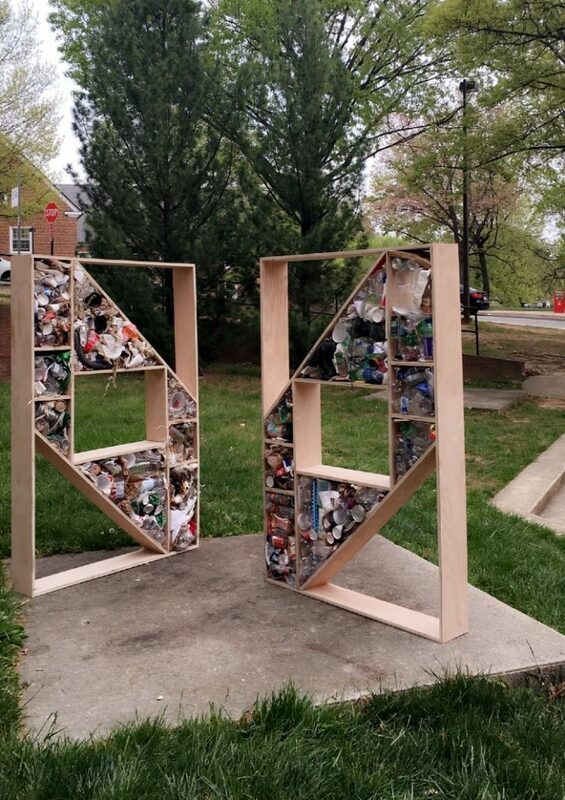 Dana Hollister, a student at the University of Maryland, recently created an art installation that brings awareness to the issue of trash and littering. Read more about the project in Dana’s guest blog below. 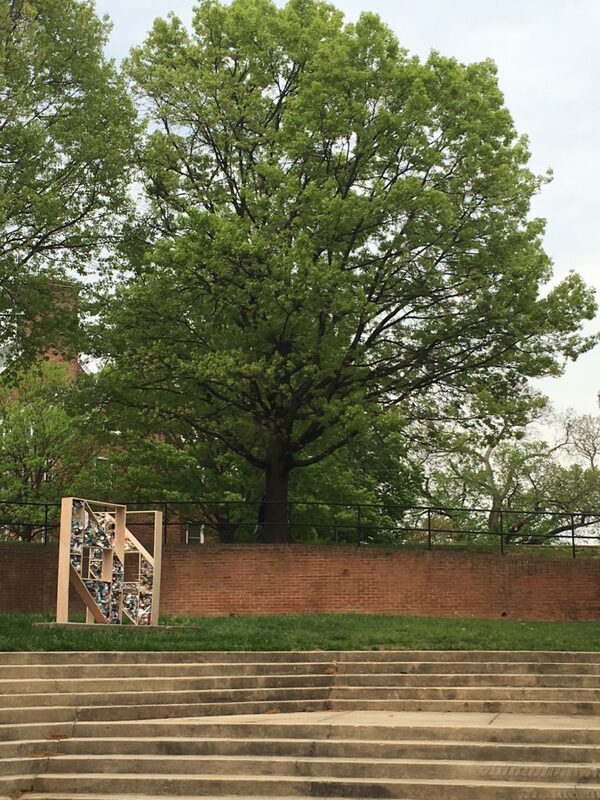 My art installation piece is inspired by the Leave No Trace policies, LNT, that I have become accustomed to as an outdoor trip leader for the University of Maryland, College Park. Growing up, I used to go on hikes all the time and I would walk by trash scattered on the ground, unaffected by its detrimental effects on nature. After learning about LNT, my perspective changed. I am now overly aware of the trash that our society leaves in the environment. As it becomes a norm, I am sure it is upsetting to others as well as myself. This piece, Leave No Trace, is based on my views about preserving nature and keeping it pristine for others to enjoy. I chose the topic of LNT not just because of my personal beliefs on preserving our environment, but also because I think it is important that more people understand how much of what we throw away finds itself lodged in a tree somewhere or washed up on our shores. It effects the animals and other people’s experiences in the outdoors (because let’s be real, who wants to go on a walk and see someone’s empty milk carton on the side of the path). The installation is made up of two 6 foot by 4 foot wooden frames with matching compartments in each of them. Selected compartments are filled with recyclables that I have found either on my hikes or by picking through the trash cans on my campus. 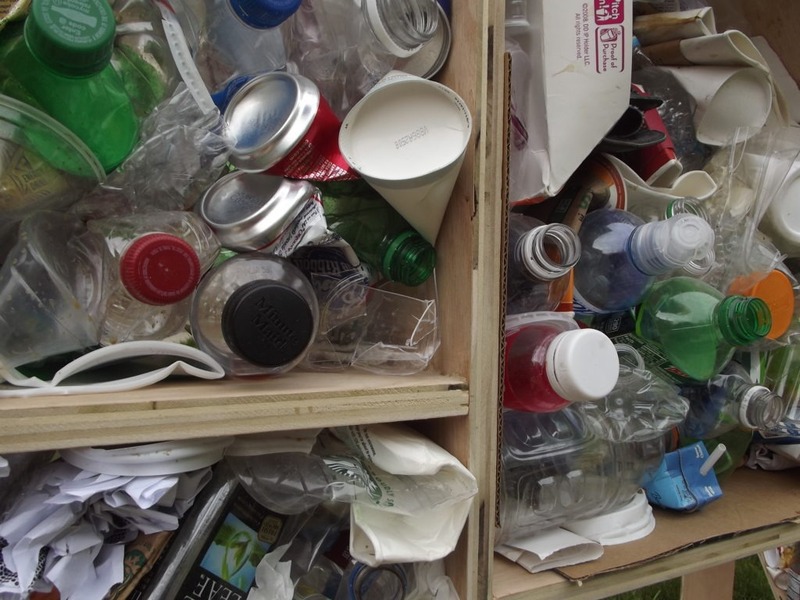 One would be surprised by how many recyclables are found in trash cans which are placed side by side to recycle bins. These compartments have no adhesive in them, they are plain trash, packed tightly enough to remain in place. One 10 inch by 5 inch compartment takes a full, 25-gallon bag of trash to fill it. It took a total of 32, 20-gallon trash bags, full to the brim of recyclables, to fill the selected compartments of both of the structures. Each frame has a certain type of “trash” in it. 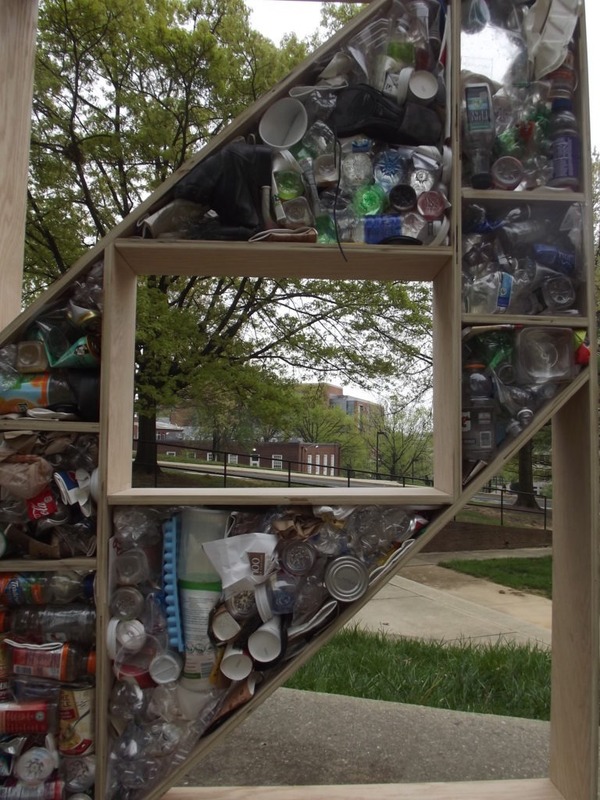 One frame contains strictly recyclables found on the UMD campus, the other frame contains recyclables and trash that I have found on my hikes along the waterways of Montgomery County. By juxtaposing these two frames, it represents the amount of trash that finds its way into our ecosystems and stays there until someone decides to pick it up or it gets washed away to another spot. One question I get a lot is, “How is using wood LNT?” I plan to up-cycle all of the materials that I use in this piece. The Leave No Trace portion that I am speaking about is only the beginning of this project. I am using wood from Home Depot that would have been otherwise sold for a different purpose. After the installation is complete, I am deconstructing the piece and reusing the wood to continue my series of up-cycling pieces. I will be documenting the progress of my installation pieces on my Facebook, Instagram, and Tumblr pages, Art by Hollister — so stay tuned! Guest blog by Dana Hollister. 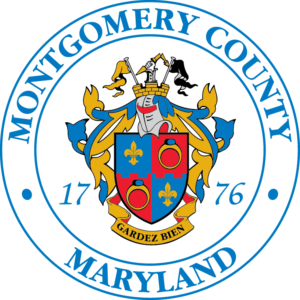 Dana grew up in Montgomery County and now attends the University of Maryland. Want tips on how you can help prevent litter from ending up in our streams and neighborhoods? Check out DEP’s webpage on preventing water pollution in your community. 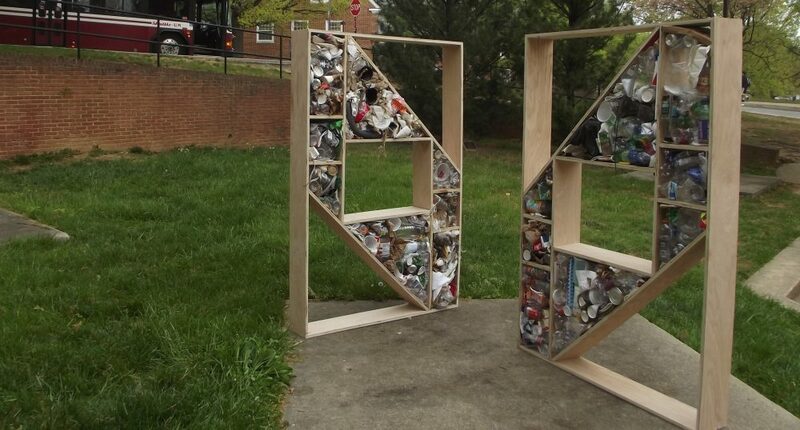 2 comments on "Art and the environment: Student brings awareness to litter"
This is a remarkable feat using discarded materials that we deem as trash. Dana Hollister has proven to us all that trash can be re-appropriated, as something for us to gaze upon and create a dialogue of conversation. In her case, it has been recycled for something with meaning for us to be concerned about; our environment. Thank you Ms. Hollister. Thanks so much for your kind words, Michael! I’ll make sure that Dana sees your comment.